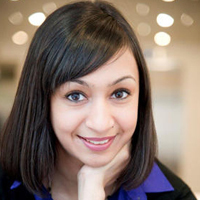 Sheffield Engineering Leadership Academy: Roma Agrawal is coming to SELA! Roma Agrawal is coming to SELA! You may recognise her face from a recent M&S campaign called 'Leading Ladies' or from a C4 documentary on the Shard where she featured as the only woman, described by The Guardian as 'a top woman tweeter', she has designed bridges, skyscrapers and sculptures with signature architects over her eight year career and has numerous industrial awards under her belt. For one night only, Roma Agrawal (or Roma the Engineer) will be coming to SELA to talk to our cohort about her road into the work she has done and her career so far. This exciting guest lecture will be open to staff and students of the University of Sheffield on Thursday 12th February 2015 from 6-7pm. Places are limited so please make sure you book yours now to avoid disappointment on the night.